3D body scanners can be a major asset to include in your club. They drive new customers seeking a non-invasive way of tackling fitness goals, they increase current member participation, and are proven to change peoples' bodies. As more and more clubs pop up onto the market, more are utilizing the technology of 3D body scanning to make customers for life. The tricky part is finding the perfect location at your gym for a 3D body scanner. Fitting a large-scale body scanner into a club might seem complicated, but with ample planning and organization it’s proven to be more than worth it. We’re happy to show you how you can take your club from average to exceptional by outfitting it with a 3D body scanner. In general when designing the floor plan for your health club, keep in mind guests want to be able to move freely. Most of your clients will be coming and going during busiest hours, and having the room and dedicated space for a 3D body scanner will allow for them to keep coming back for more. Think about space like this: in the case that the customer’s current machine or equipment is in use, they may want to try and supplement that with some work on the floor. You need to remember that stuffing your club just because you can will prohibit you from adding new, exciting equipment in the future. Keeping plenty of floor space and making the overall flow of your space functional is something to do first. According to GymSource, facility planners often underestimate the usage of their fitness centers by 5-10%. This can lead to overcrowding and dissatisfied customers with no room to spread out. In designing the floor space of your club to make room for a 3D body scanner, it is to your benefit to offer more space than you think you’ll need. Take into account high-traffic times, like after 5 PM – this is a time you will want to wow the clients walking through your doors at your organization. Letting them walk away thinking that they could barely train due to crowdedness would be a blow to your business. After you’ve created ample space for clients to move about, you’ll need to determine a semi-private space for you to conduct body scans. Most gyms simply won't have an entirely vacant and unused room in their facility. It's during this time you'll need to find the way to get the best of both worlds. 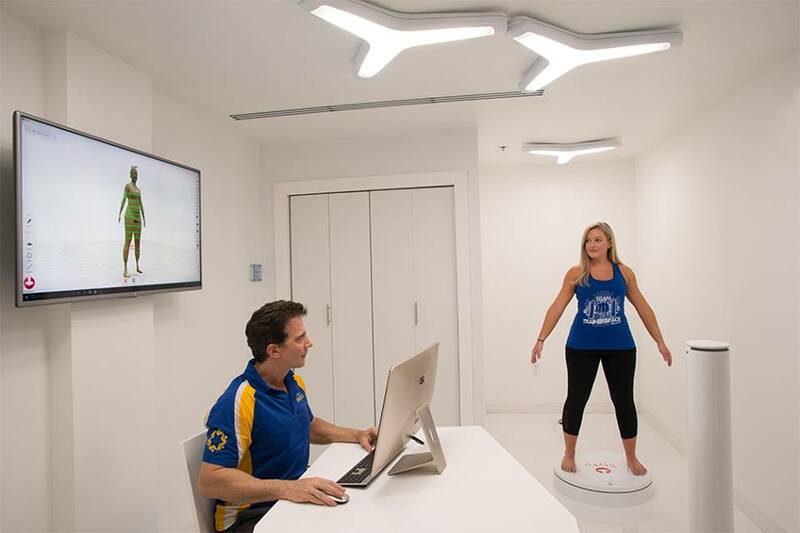 3D body scanning isn’t invasive – but it will be a moment most will want to keep between their trainer and themselves... and the size of the 3D body scanner is not large, but you’ll want to dedicate either a small room or a closed-off area to consult with members after their scans. Where you decide to conduct 3D body scans will be where you need to get creative. Have a conference room you don’t use more than once a month? Does your yoga class only take place on Sundays, yet you have an entire room devoted to it? Think about double-usage spaces; that way, you’ll maximize the amount of revenue you’re bringing in by having a safe, open area away from the hustle and bustle of your gym. Customers will appreciate a space that they can relax and find their body measurements and fat percentage without wandering eyes. After our exclusive interview with club designer Cuoco Black, we’ve determined this: offer the client an experience that sets you apart, and watch the deal seal. “Aesthetics become a powerful component of the sales process, because when people come in and see the reception area, their jaws drop since they have never been in a gym like it before,” Black said. The famous health club designer noted that the design and sales process should be one in the same in order to sell the high-tech experience. Think futurism, and clean, modern design that coincides with the branding of the 3D body scanner. Additionally in our interview, Black noted that instead of having a desk with a salesperson trying to sell you a deal, they bring them into that designated 3D body scanning room. This way, the entire 3D body scanning experience begins and ends with the customer impressed and excited. With a strong design, ample space, and the ability to get creative in where you decide to conduct body scans, you’ll be on your way to retaining higher numbers of customers seeking serious change. Learn more about how Styku can set your club apart and put you at the forefront of health and fitness.